BY SAM SPOKONY and LINCOLN ANDERSON | A West Village church hopes to construct a 15-story residential building on the corner of Greenwich and Barrow Sts., in order to fund both an expansion to its private school and the construction of a new mission building that will provide 24/7 services to L.G.B.T.Q. youth and other underserved people. The Church of St. Luke in the Fields — which owns the entire block that is bounded by Greenwich, Barrow, Hudson and Christopher Sts. — plans to grant a 99-year lease to Toll Brothers, a luxury developer, for management of the future residential tower at 100 Barrow St., which would rise to about 153 feet. That’s 23 feet shorter than the massive Archive residential building on the other side of Greenwich St., but 33 feet taller than the building directly to the south. Representatives of the church and its associates are quick to note that the proposed 70,000-square-foot, as-of-right building is much smaller than what zoning allows. By law, a residential development on that spot could be built up to 200,000 square feet. The building is also planned to be so-called “80/20” housing, in which the developer would receive a tax break for making 20 percent of the units affordable. Currently, 10 of the tower’s 46 rental units are planned to be affordable, while the rest would be market rate. In an interview on Jan. 14, Barry Rice, the projectʼs architect, said that the developer has not yet filed for a 421a exemption for the 80/20 tax break, which requires state legislative approval, but that they plan to soon. When explaining the plan for 100 Barrow St., those behind the effort refer to it as the “economic engine” for the church’s goals both to expand the financially strapped St. Luke’s school — which borders the church within its self-owned lot — and build the new mission center. Since the proposed development site lies within the Greenwich Village Historic District, the plan will need a certificate of appropriateness from the city’s Landmarks Preservation Commission before moving forward. Representatives of the church, the developer and their architect are currently scheduled to go before the L.P.C. on Feb. 4. St. Luke’s, which includes pre-K to eighth grade and is currently located in a two-story building along Greenwich and Christopher Sts., had 200 students in 2012, when it started expanding. “We realized that in this day and age, with the economic expectations and also the academic evolution of schools, to have just 200 students was not a generationally sustainable model,” said Bart Baldwin, head of St. Luke’s School. Since then, the Episcopal, nonprofit school has constructed two additional classrooms and currently serves 228 students. Eventually, if the income-generating 100 Barrow St. building is approved, the school hopes to construct two additional floors — a total of 20,000 square feet, including nine classrooms and a 4,000-square-foot gym — and expand its enrollment to 320 students. The expansion level would make heavy use of yellow-colored brick. The schoolʼs current small gym would become a 200-seat auditorium/theater. Slightly more than half the children currently attending the school live within Community Board 2, according to Baldwin. He stressed that a similar portion of those potential new school seats would serve the Village area, which has faced plenty of school overcrowding in recent years. St. Luke’s annual tuition is $34,000. About 23 percent of the school’s students get financial aid. The square block was formally part of Trinity Church, but in the 1970s Trinity “spun off” all its chapels, which are now independent, except for St. Paul’s. The church currently has a Saturday night feeding program for L.G.B.T.Q. youth and H.I.V.-positive people that accomodates 80. But the program is outgrowing the space — which is why St. Luke’s wants to build a new mission center on the site of the school’s current playground at the corner of Hudson and Christopher Sts. “It’s an incredible ministry,” Stacey said. As for when the mission would be built, Stacey said they can’t say exactly when, since it would depend on 100 Barrow St. getting constructed, and the revenue from that. “We don’t have the money to build it yet,” she said of the mission. The mission would be “townhouse scale,” with a 24/7 drop-in center. Individuals would be able to get a change of clothes and take showers. It won’t be “a homeless shelter,” Stacey said, though they are allowed under regulations to do an eight-to-10-bed facility. In the future, the mission building could be “repurposed” to meet whatever the community’s needs may be — perhaps serving seniors, for example — she pointed out. As for the playground that the mission would eventually replace, the expanded school would have recreational space on its rooftop. The block’s gardens — which are the “fields” of St. Luke in the Fields, and are also known as “The Close” — would not be reduced for any of the projects, Stacey stressed. And with the construction of the Barrow St. tower, the rear gardens behind three townhouses on Barrow St. that the church owns would be better opened up to public view, though would not be available for actual public use. They hope to start construction on the Barrow St. tower and the school expansion this summer. The school addition would be built “like a bridge” on piles over the existing building, which dates from 1955. Work would be done during non-school hours and over school breaks. Andrew Bartle is designing the school expansion, while Beyer Blinder Belle is coordinating the entire project. Regarding the three Barrow St. townhouses, the tenants there are currently non-church affiliated and on one-year leases. The buildings would be emptied and extensively renovated, also by Toll Brothers, with each townhouse getting up to $2 million worth of work on it. Rice, the architect for the Barrow St. tower, explained that the building materials for all the new construction are based on the color palette of the type of bricks used in the area. The middle section of the new tower would be copper clad, which would take on a light-green patina over time, mirroring accents on the church. They stressed that there would be “no segregation” at the Barrow St. tower, with the affordable units’ tenants sharing the same entrance as the market-rate tenants. The rector stressed that they are not a wealthy congregation — many of the worshipers are artists and self-employed — and that they need this project to move forward sustainably into the future. The church’s current endowment for the entire block is only $2 million, she said. It’s a long-term plan the church has been carefully planning for decades, added Rice, who is also a school parent. “It hasn’t been rushed to this point,” he said. The St. Luke’s group presented their project to Community Board 2ʼs Landmarks and Public Aesthetics Committee later on Tuesday evening. The committee, however, had its criticisms of the mission component, the tower’s height and some of the building materials. Speaking afterward, Sean Sweeney, the committee’s co-chairperson, said, “St. Luke’s was saying this would help the community, but it’s a private school, and a center for troubled youth, which the community has had many problems with along Christopher St. The community found an irony in that part of their proposal. “And how does it benefit the community to build a 15-story building that’s out of scale with the rest of the community?” he continued. The committee’s resolution will recommend approval of the school expansion, ask that the tower’s height be lowered and also ask St. Luke’s to provide a master plan. I like it, though it's a bit tall for the area. ^ There's a taller and bulkier building just across the street. I know, but they're old, and we don't need to add more, particularly next to those small Federal-era townhomes. I'm of the opinion that those townhouses are better highlighted by the taller building next to them than something similar in height to them. Contrast works better to bring out something's unique features than something that strives to imitate it. I like it. The miserable empty lot currently there has no business existing. Commissioners generally concurred that the parking lot was an appropriate site for residential development and that vertical enlargement of school was compatible with the historic district. On March 11, 2014, the Landmarks Preservation Commission heard from applicants on a proposal to build a residential tower on the Church of St. Luke in the Fields’ campus and to expand the existing school. The applicants responded to extensive public testimony from the February 4th hearing, and were advised by Landmarks commissioners on the appropriateness of the project. 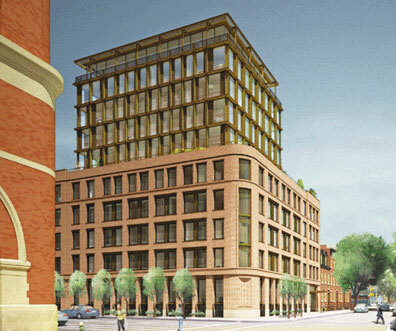 Local elected officials, Manhattan Community Board 2, residents and preservationists opposed the project sited at the western edge of the Greenwich Village Historic District. They found the proposed tower too large for the district, and the design and materials inappropriate. Other residents spoke in support of the proposal. A representative of the Real Estate Board of New York noted that the plan would bring affordable housing to the neighborhood. Consultant Bill Higgins, retained by both the school and the tower developers, Toll Brothers, spoke to the “characteristic combination of scales” that defined Greenwich since the 1920s. Higgins also stated that the proposal needed to be considered in the “the real context in which this site exists,” close to the large Archive Building, an individual landmark standing outside the boundaries of the historic district. Responding to criticism for the use of brightly colored metal panels, Higgins said the glass and metal additions to the school, designed by Andrew Bartle Architects, were harmonious with the brick while remaining distinct from the historic fabric. Higgins said the design of the addition drew on traditional mansards, and the colored panels reflected a “youthful quality” appropriate to a school. Architect Barry Rice noted that the proposed tower was shorter than the Archive Building, and that the project would retain a public garden space and a visible private garden space. Rice said the project was “very site specific,” and that the tower had been mischaracterized as a “glass box.” Rice reiterated that the building was composed of various forms, in a variety of materials, including glass, bronze and brick. Landmarks commissioners responded by first addressing the appropriateness of the tower development. Commissioner Michael Goldblum found that the site of the planned tower, currently a parking lot, could sustain a large building. Goldblum, however, found the proposed articulation too complex, and recommended a “simpler, quieter approach.” Goldblum also found the proposed “campanile” overwhelmed the church’s steeple, and suggested that the building’s massing be lowered. Commissioner Margery Perlmutter said the immediate neighborhood did not possess examples of juxtaposed buildings of differing scales. Perlmutter further stated that the proposal contained too much glass, and suggested that the base would benefit from more detailing. Commissioner Michael Devonshire determined that a lower, squatter building could be appropriate for the site. Commissioners were divided on the appropriateness of the school addition. Commissioner Libby Ryan found it appropriate as presented, and said the “exuberance” of Greenwich Village “shouldn’t be squelched.” Commissioner Goldblum determined that while the massing was acceptable, the colored metal panels felt “arbitrary and commercial.” Commissioner Diana Chapin found the panels to be “disrupting.” Chair Robert B. Tierney said he would support a zoning intervention that would allow the applicants to construct a building with similar bulk to that proposed, but lower, with less complexity and fewer setbacks. Chair Tierney asked the applicants to study the additions further, make revisions and bring both applications back to Landmarks at a later date. LPC: 100 Barrow Street; 657 Greenwich Street, Manhattan (15-1091; 15-1090) (March 11, 2014) (Architects: Beyer Blinder Belle, Andrew Bartle Architects, Barry Rice Architects). The proposed West Village building for the Church of St. Luke in the Fields will now stand three stories shorter than its original design as a result of a new ruling by the Landmarks Preservation Committee. The commission, which rejected the church’s proposal to build a 15-story, 153-foot-tall tower atop a parking lot at 487 Hudson Street in March, unanimously approved the new design on Tuesday. The tower will be 121 feet tall, or three stories shorter, than the original design. Despite the revision, the building’s overall size actually increased by 1,400 square feet, though the number of residential units remains the same. While the church plans to allocate a portion of its residential tower to affordable housing, some Greenwich Village residents voiced concern over the lack of a public comment period following the presentation made by the project’s architects. I would have preferred the brick setback tower in the original design to remain as that looked very nice and instead eliminated all the glassy middle section. Of course all the silly concern here is to chop down the height instead of worrying about what looked better for the area. Idiots! The old design was fantastic! Meanwhile, this is the city that lets 1,000 Kaufmans bloom. The city's forbidding emphasis REALLY needs to move from height to design. 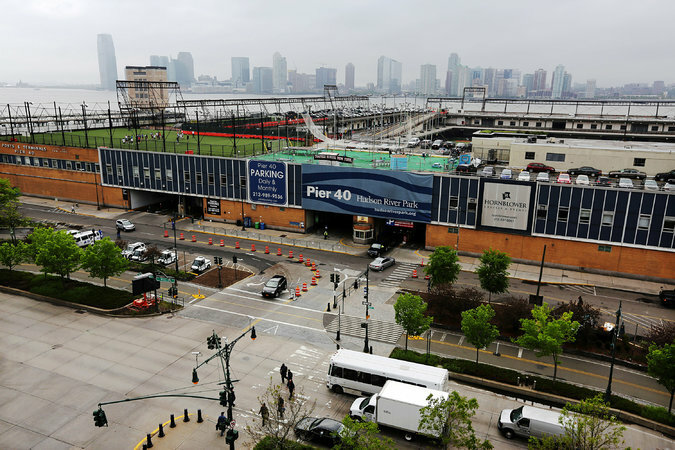 Pier 40, above, is deteriorating faster than originally feared, a report is expected to reveal. 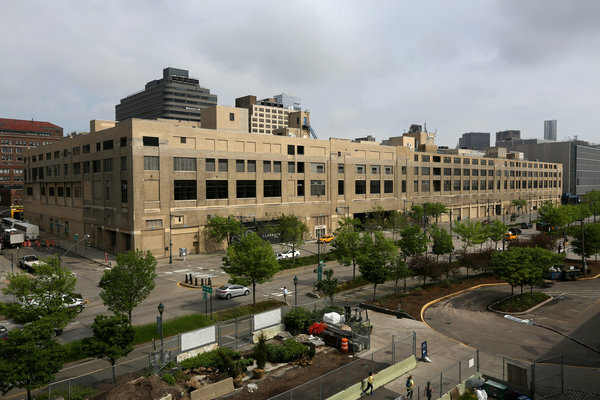 A deal to develop the St. John’s Terminal Building, left, could fund the repairs. Great! St John's terminal is an eyesore. Pier 40 also is. Hopefully, it will get a new brick facade. Though Ian Schrager's condos on the Hudson River have been in the works for some time now, few details have been available: we knew they were being designed by starchitecture firm Herzog & de Meuron; that the address changed from 357 West Street to 160 Leroy Street; and that residents would have 50 pricey condos to choose from. And now, an article in the New York Times revealed more details on the somewhat mysterious development, including the fact that the sales gallery is now open to prospective buyers. But those buyers will need to pony up plenty of cash: one-bedrooms begin at $2.6 million. There's also a "12,000-square-foot penthouse with about 7,500 square feet of outdoor space and a private pool," though Schrager remained mum on how much that one will cost. The number of units has been bumped down to a modest 49, and will rise 15 stories over the Hudson River. As seen in the rendering above, Herzog & de Meuron's curved building remains much the same as the older renderings, and will feature floor-to-ceiling windows that will "improve sightlines and offer views in more directions," according to the firm. The building will also have a 9,750-square-foot courtyard, designed by Madison Cox Associates; it's all expected to be completed in 2016. Greenwich Village Preservation Watch - Be on the alert!